Historic stone-built doocots that were used to house pigeons can be found widely in Scotland, and are often associated with castles and country houses. The fact that they are relatively small, strong constructions mean that they have resisted the ravages of time. At the time of their construction they enabled a regular source of choice meat to be readily available. 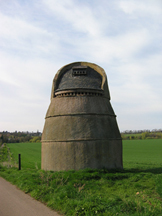 This doocot is located at Phantassie in East Lothian (to the east of Edinburgh) near to where I used to live.